Please pray for the communities who are impacted by Cyclone Idai. May God’s healing presence give them peace and hope in their time of need. Pray that God will comfort those who mourn the loss of loved ones and strength to those who are delivering aid and rescue. 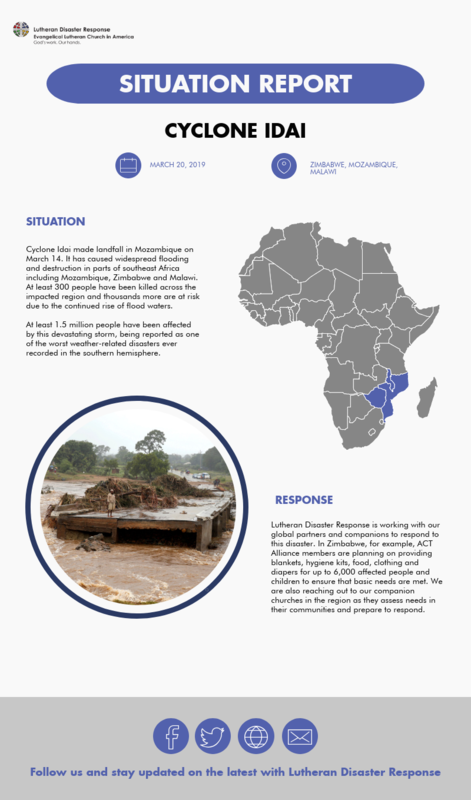 Thanks to generous, undesignated donations, Lutheran Disaster Response is able to respond quickly and effectively to disasters, including Cyclone Idai in Zimbabwe, Mozambique and Malawi. Give to Lutheran Disaster Response to support the response to Cyclone Idai. Click here to download a PDF version of this situation report.